It only takes a few minutes of speaking to Richard Spencer before he tells me about creating a white supremacist colony on the Moon. 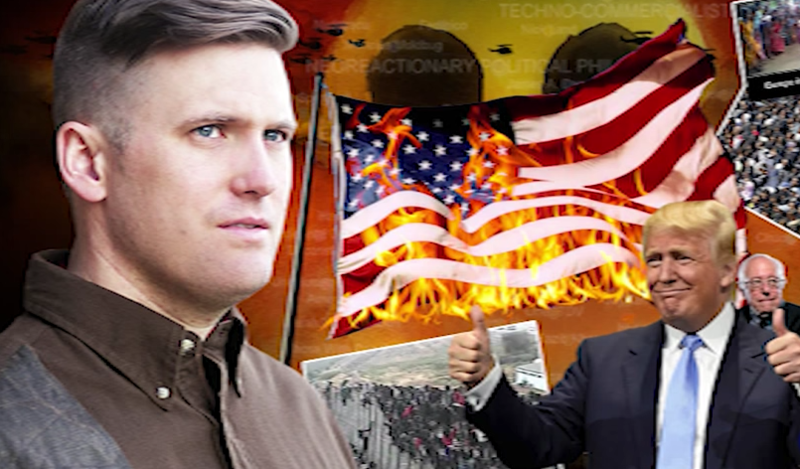 Richard Spencer, America’s leading neo-Nazi, is enjoying a flutter in the mainstream, following years spent in the murky wings of internet forums, peddling bilge about Jews and white pride. Welcome to the world of Richard Spencer. 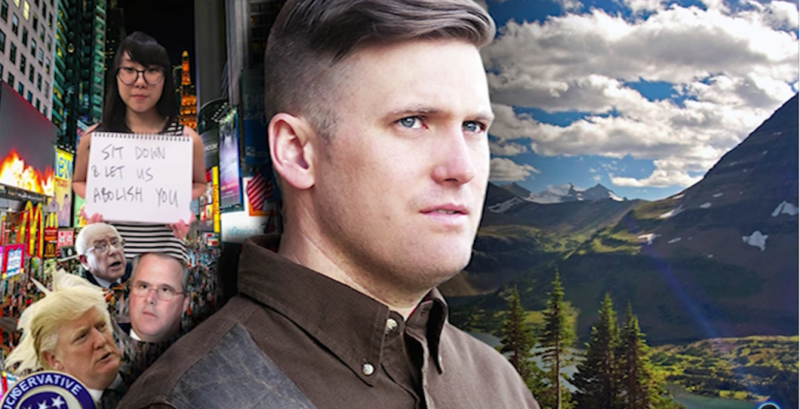 Your mother has come under fire from her neighbors in Montana – how have your parents reacted to your alt-right movement? I’ve joked about this, my parents think I’m a bit crazy. They’re not political people. I’m obviously their son, so they’re not going to disown me. They’re very mainstream people. I want my ideas to be mainstream but I totally recognize they’re heretical. I have no interest being on the fringe. Some people love to be on the fringe, they think of themselves as “Oh, if you’re mainstream, you’ve sold out.” I want these ideas to be mainstream. So what was their immediate reaction? Look, they recognize I was dealing with heretical ideas, they would have much preferred if I would quietly publish books as an academic pursuit. I think they would probably be OK with that. But I recognize one of the primary ways to communicate these ideas and bring them into the mainstream is to have media exposure. I am willing to do that. And I’ve always thought of myself as someone who should be in the mainstream. I’m smarter and more interesting than 100 percent of the conservative movement. And I’m not really bragging. The conservatives are just dorks. I’ve met tons of them, I’ve never been impressed. I should be the one who’s expressing opinions. I have more to offer than all of them. I want to be alt-right, I want my ideals to be taken seriously. I want to have a seat at the table. My parents want to have a boring life. They’re older, they’re not political. They’re not confrontational. It’s not like they think my ideas are immoral, they’ve never been plugged into nationalism or identitarianism, or traditionalism. This is not their milieu at all. Do your parents ever say they’re proud of you? I probably hear more criticism than that. You spoke at Texas A&M last week, what else have you got planned on campuses? We’re planning a campus tour. I don’t want to give away the specifics, but Texas, the West Coast, and the Midwest. A few months ago, I could have just gone to a campus like I did at Berkeley. I can’t do something that guerrilla or organic. What I need now are contacts at the university who will set up a debate or speech. We have to go through a formal process. Has there been any interest? Yeah, lots of people are reaching out. I don’t want to name them. I can give you hints, in terms of upper-Midwest, West Coast and Texas. I don’t want to name specifics because I don’t want to jeopardize these events. I’m a little bit afraid if I announce them and it becomes public, there will be a crackdown at the university. We’re doing a college tour, the aim is to have such a response there’s no way I couldn’t do it. Some of your followers admire your look – the haircut, the suit. How cultivated is your image? It’s cultivated sure, but it’s not a PR stunt. This is who I am. I’m not pretending to be another person. I do care about fashion and how I look. Our movement can often be associated with some standard types, that are really unfortunate. Obviously, there’s the redneck stereotype, the romper stomper, skinhead, neo-Nazi stereotype, there’s the 1950s segregationist stereotype, I could go on and on. I’m not like that. That’s not who I am. I recognize it’s important to be fashionable but also present an image. The way I think of our movement is as dangerous but intelligent. Dangerous in the sense of exciting, forward, vanguards. But also people who have something to bring to the world. We’re the types of people who are going to have great suits. That are going to present themselves in an exciting way. But also never be fuddy-duddy. So does that mean more waistcoats for the alt-right? Waistcoats, yeah, haha. I might make that my thing. I’ve met many people in this movement, there are different kinds of people. I’ve met tons of people who are in the technical field, IT or coders, or work in software. A lot of people like that. I don’t think that’s a coincidence. They are more likely to be early thought adopters. Housewives, businessmen, people who are poor and middle class and wealthy. I would say most are certainly men. The nature of a vanguard political movement based on ideas, mostly you’re going to get men who are going to be attracted to those. But I do see women, and I think women will come, particularly as the alt-right become the bad boys of Washington, the bad boys of the right. It’s good for some people to maybe start thinking about the alt-right not just as these ideas, but also meaning that I take care of myself. So being alt-right means I go to the gym. And I lift. Being alt-right means I watch what I eat. I care about myself and I have a sense of high and low, so I’m not going to eat donuts and wear sweatpants. I’m going to be a presentable sharp, high energy person. So tell me about your exercise regime. Yeah, I lift weight. I’ve always played sports. I’m never been great at sports. I’m kind of an average athlete. I definitely enjoy skiing, mountain-biking. I definitely lift weights. I’m by no means Arnold Schwarzenegger. But yeah, I can bench press close to 250 pounds. I can dead lift over 400 pounds. I take care of myself. There are many people who would hear those numbers and stop and laugh at how weak I am. I take care of myself. I’ve never been a great athlete. If someone becomes alt-right and they’re just a guy likes the ideas and so on, and they see the alt-right and they say I’m going to start paying attention to how I look. I’m going to start exercising. I’m not going to pig out on fast food. I’m going to care about what I’m going to do to my body. I think that would be a great thing. It’s just as important as the ideas, is that we have a culture that’s admirable and attractive. What’s the big deal with your movement and Jews? Well, it’s not a big deal. I think that one aspect of the alt-right is that we have taken Jewish influence seriously. It’s something we are willing to talk about, this very taboo topic. Some of the other people aren’t. It was an interesting exchange with a rabbi who came to this press conference. I don’t know what he was expecting exactly. But there’s a lot we can learn from the Jews. Having a sense of themselves, this ability to even through hardship and trials to maintain their identity. It’s something we can learn from. We’re willing to recognize that. And therefore we’re willing to take those things seriously. To be critical, if that’s demanded. To understand that Jews might very well have their own interests, that run against the interest of the Europeans. The alt-right is very reasonable on these issues. It’s how we would examine any people. If you’re a Mexican immigrant, I’m not going to say that Mexican immigrants have exactly the same consciousness, and exactly the same identity, and exactly the same hopes and dreams as a white person from Ohio. What do you mean when you want a white ethno-state in America? I don’t necessarily think it would be in America. This would be a post-American invention. It’s something to think about. I do think the current paradigm is going to break down. Unless there is dramatic change, I think the current paradigm is going to break down, and it’s going to lead to some unpleasant things. I think it’s going to lead to blood and tears. So where if not America? It could be anywhere, it could be on the Moon. Come on, you don’t really think there’s going to be a new state on the Moon? Why not? I’m saying that in order to stress the conception of it. There’s a Jewish state, must it be in Palestine? Certainly there were other ideas about a Jewish national state in other parts of the world. The whole idea is to think of an ethno-state as a way out. If the current paradigm is unsustainable, and I believe it is, what would we want afterwards. It’s a thought experiment. It’s a way to think about a future political order, but it’s not going to happen tomorrow morning. It’s something we should think about. How do people react when you tell them about your views in private? Is it easy to meet people normally? It’s become more and more difficult for that reason. I am a little bit circumspect, and other people are as well, to say let’s just go meet in a restaurant in downtown Washington. I will still do this, but a bit cautious. I can still walk down the street. I find it interesting, I went to Texas A&M and went through LAX. 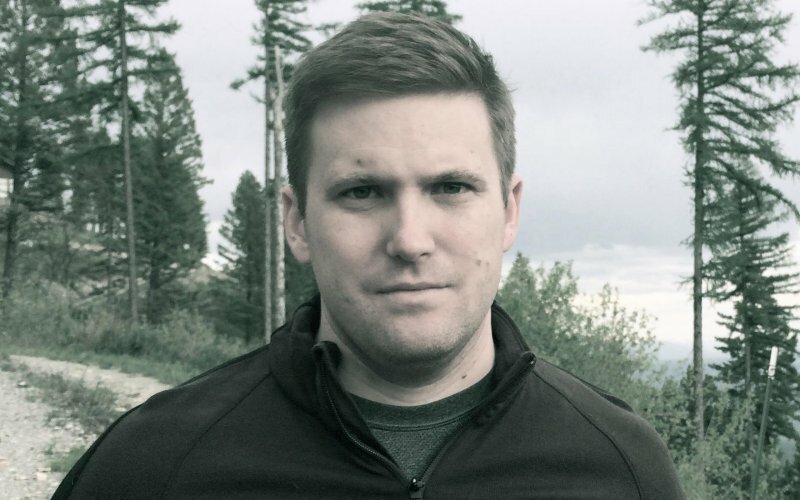 I had a couple of people come up to me and say, ‘Oh, are you Richard Spencer?’ And they were fans. It was nice. But at the same time, everyone wants to just go over to the corner bar and not get harassed. So it is what it is. I have always recognized that if we’re going to make an impact, we have to accept the fact we’re going to get attacked. I do think this will go away, but I didn’t think people would be going after my mother. I did always recognize I would get attacked. That doesn’t mean it’s nice, or correct, or fair. Does it make it harder to find a partner in your life with the alt-right? Right, it’s always been very difficult with my life. It’s been a difficult thing. Meeting people around town in DC, in Arlington, it’s been fairly difficult for a little while but it’s become more intense now. Are you able to have a love life? Sure, look, I have a life. I’m not on the dating scene, but yes, there are some difficult moments. There are some worries that I want to go hang out with you, but I don’t want to jeopardize my life, and that’s a totally legitimate worry on their part.